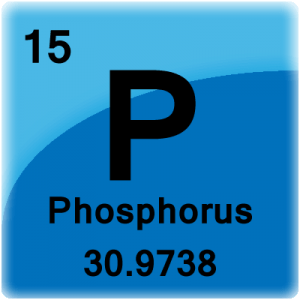 Phosphorus is the 15th element of the periodic table. These phosphorus facts contain chemical and physical data along with general information and history. Discovery: Hennig Brand in 1669. German alchemist Hennig Brand isolated phosphorus from urine. He initially called his substance “cold fire” because it glowed in the dark. Name Origin: Phosphorus was named from the Greek word phosphoros meaning “light bringer”. Natural phosphorus is comprised of one stable isotope: 31P. Twenty two radioactive isotopes exist ranging from 24P to 46P. Phosphorus-30 is a stable isotope containing 16 neutrons. 100% of natural phosphorus is phosphorus-31. Phosphorus-32 is a radioactive isotope containing 17 neutrons. Phosphorus-32 decays by β- decay into 32S with a half-life of 14.263 days. This isotope is used by biologists to tag DNA and RNA changes. These are allotropes of phosphorus. From left to right: white (yellow), red, violet, and black metallic. Phosphorus has four allotropes: white, red, violet and black. 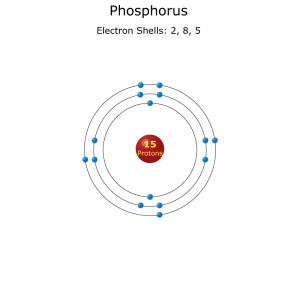 Electron shell configuration of a phosphorus atom. Phosphorus is highly reactive. It is not found free in nature. White phosphorus is a waxy solid and very poisonous. The lethal dose is around 50 mg.
White phosphorus glows in the dark and can spontaneously combust in air. Red phosphorus is found on the side of matchboxes. Red phosphorus is formed when white phosphorus is heated to 250 ºC and forms a vapor. The vapor is then collected under water. Phosphorus is essential to life. Phosphates (PO4-3 ions) are a major part of each molecule of DNA and RNA. They are the P in ADP and ATP, the molecules responsible for energy transport in the cell. Phosphorus is found in bones. Ashes from bone was an early source of phosphorus. The second of the three numbers on fertilizer is associated with phosphorus. Phosphorus is the sixth most common element in the human body. Phosphorus is the seventh most common element in the Earth’s crust. The border between Bolivia and Chile was altered because of phosphorus. Chile and Peru went to war with Bolivia over access to lucrative guano islands off the coast. Guano is high in nitrogen and phosphate, and in 1879, a vital source of both elements. Ultimately, Bolivia lost the land that connected them to the Pacific Ocean. Overuse of phosphorus and phosphates in the environment causes algae to bloom in rivers and lakes. The excess algae uses up all the dissolved oxygen in the water and fish (and the algae) dies. Hennig Brand’s process to get phosphorus from urine was a tightly kept secret. He chose to to sell his process to other alchemists. This process became more widely known when it was sold to the French Academy of Sciences in 1737.